Motorcycle seat upholstery can boost your riding pleasure this season. Your bike, scooter or ATV will attain a new level of comfort and start to look better than ever, once the old seat is lovingly refurbished by passionate professionals. Motorcycle seat recovering is very popular in Tallinn, Estonia, and is a significant part of Saleks Grupp OÜ services. By choosing us you choose experienced and qualified experts that can recover and restore a bike seat of any configuration. Motorcycle seats are usually covered with special synthetic leather that is highly durable and water resistant; this material was created especially for cars, bikes and other vehicles. This synthetic imitation leather is resistant to temperature and climate shifts, and provides long-term and trouble-free operation. A motorcycle seat can also be covered with genuine leather, but genuine leather requires care and protection to make it last longer. Leather may suffer from exposure to moisture and sunlight. It needs to be covered and treated with special solutions to protect it. Our experts will help you choose the best upholstery material, according to your wishes and preferences. The new design of the seat can be solid-color or multi-color, with or without the use of logos and embroidery. The cost depends on the complexity of the job, the materials and the type of seat. We offer a wide range of services, from small repairs to complete redesign of the seat by changing the shape and completely re-upholstering it. Changing the shape of the seat to fit the owner is in big demand. As a result, the bike becomes very comfortable to ride particularly for its owner. Our shop will always offer you the best, most affordable and quality solution for fine tuning bike seats in Tallinn. 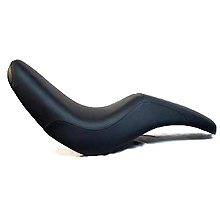 Saleks Grupp OÜ service guarantees a beautiful and comfortable seat for every bike owner.